Videxio has announced its new interoperability service to enable Video Conferencing interoperability for Google Hangouts Meet. 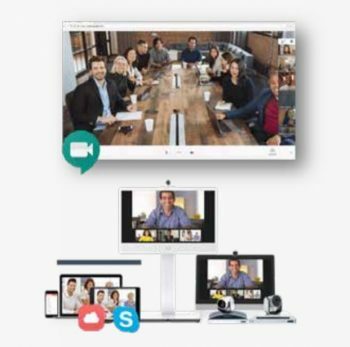 The new Hangouts Meet service, available through VideoCentric, means that users will be able to join Hangouts Meet using their existing Video Communication solution, whether that be Microsoft Skype for Business, Video Conferencing system from the likes of Cisco or Polycom, and Videxio clients for desktop and browers including Google Chrome Microsoft Edge and Safari. Based on Pexip Infinity technology and hosted within the Google Cloud, the Google Hangouts Meet interoperability service utilises the Videxio Midgard platform to ensure security, quality and reliability for users. – Rany Ng, Director of Product Management at Google. Pexip Infinity was designed for the purpose of interoperability between multi-vendor solutions, and Videxio provides the Pexip solution within the cloud. With Google Hangouts Meet interoprability, organisations using the G-Suite of applications can now communicate more widely with other organisations or teams across the globe, meaning more productive and efficient meetings with anyone, anywhere, anytime. As a leading Videxio partner in the UK, VideoCentric are pleased to announce to customers that they will be making the Hangouts Meet service available by the end of June 2018 for UK organisations, and invite you to find out more, see a demo, and get pricing for the interoperability service now.